##4.2 : What You Will Learn from This script. given location, You can Do this using This Application, just by pressing defined keys. that these will be usefull. ##@ What Do you mean By Defined Location. just like that, I said, Where is Your Desktop on Your Computer, You said, "C:\Users\S\Desktop"
so , C:\Users\S\Desktop is a defined location with in Your computer Envirenment. So, Learn this while working on windows with PATHS. Later You can use all these locations with refrence to a defined KEYBOARD KEY. # Operating System : linux, I am using Slax. 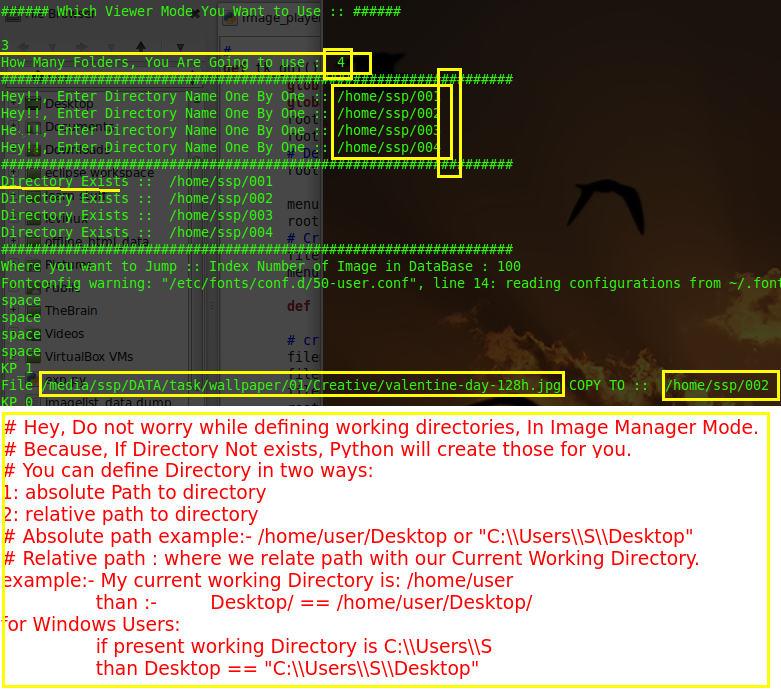 ### current Directory means :: directory from/in which you are running your This Python Script. So, If you have Installed this on windows, this will be better to define your current directory by yourself. 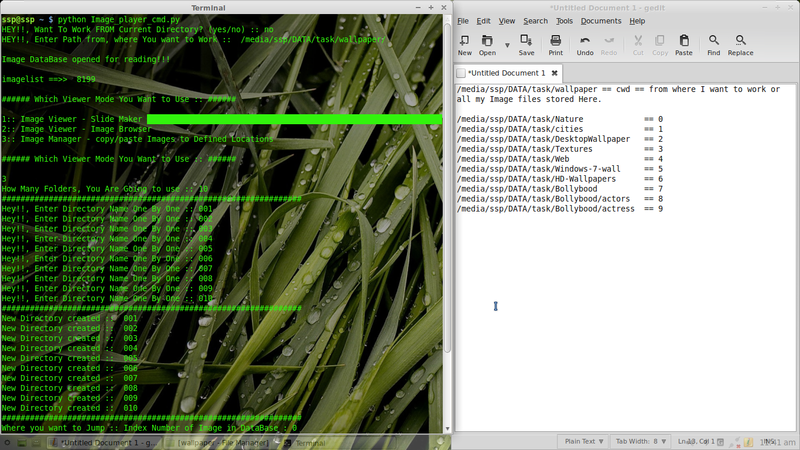 if you run this script from That directory, which contents yoyr Image Files. ### jump :: jump means, from which index location you want to explore Images. 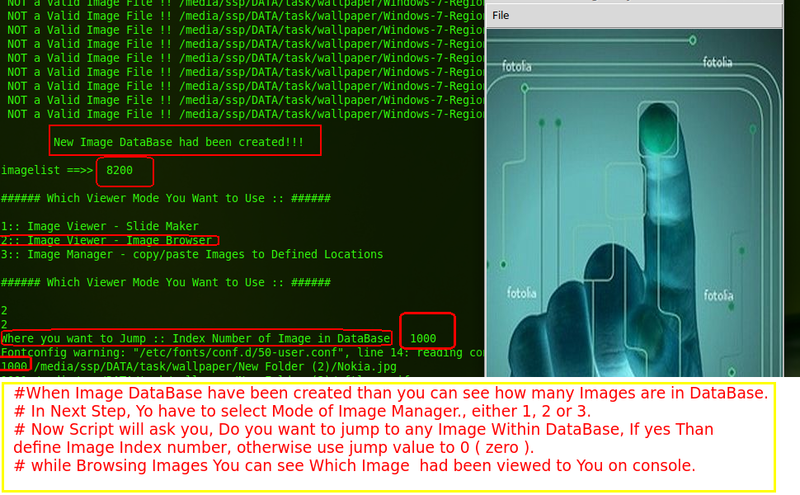 => suppose, first time when i run this script, I have explored Images Up to 100 index within Image Database. => jump value to 101. #### setting up a splash screen for application..
2:: imlist( PIL image objets.. ))"""
files =            # total number of files found while walking into given path..
# Creating a list of total files while walking..
print "## Creating Image DataBase :: WAIT ##"
print "## Hey! !, This is a One Time Process for One Path :: WAIT ##\n"
for i in range(len(files)): # create a index number for acessing a given directory having root, dirs, files ..
for j in files[i]: # accessing only files from that directory, selected using index number i ..
# and our next step will be to recoed the name of valid image file to imagelist..
# DataBase will be saved in your current working directory!!! print "\nImage DataBase opened for reading!! 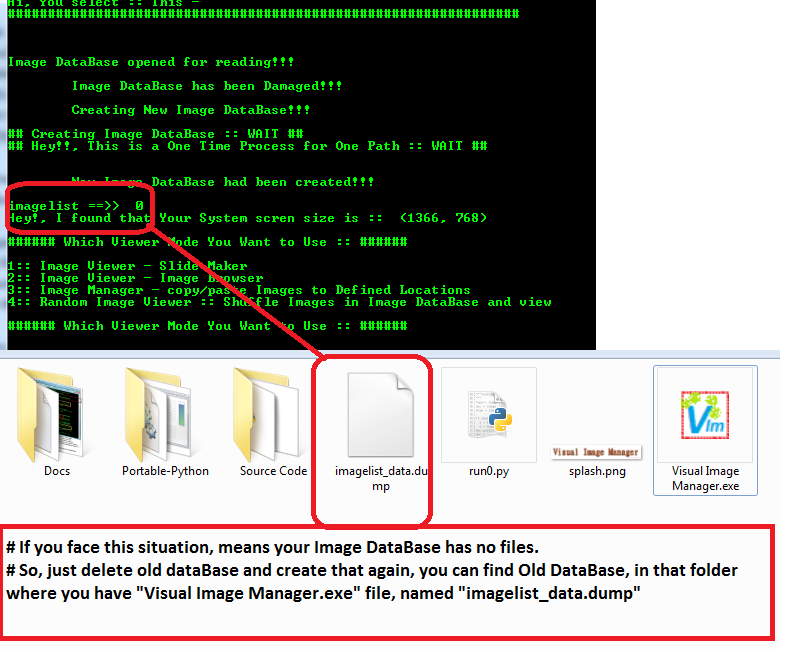 !\n"
print "\tImage DataBase has been Damaged!! !\n"
print "\tCreating New Image DataBase!! !\n"
print "\n\tNew Image DataBase had been created!! !\n"
print "Hey!, Delete This Image DataBase and Create Again! !\n"
def sayHello(): print "Hello, I am Happy!!" print "\nMay be, This Image is corrupted or Not Supported!!" This Function shows, Hey, you have type this key!! #### This Function is used, When There are more Than one Images with same name in your same folder. #### And we Are Using time.time() function which always return a unique value, because time will always be unique. #### should be run when a defined key is being pressed. print "\n###### Which Viewer Mode You Want to Use :: ######\n"
print "1:: Image Viewer - Slide Maker "
print "2:: Image Viewer - Image Browser"
print "3:: Image Manager - copy/paste Images to Defined Locations"
print "4:: Random Image Viewer :: Shuffle Images in Image DataBase and view"
2: Image Browser Mode :: means allow you to browse Images manually, just Hit "Right" allow on your keyboard abd Hey!! now you will be next image that had been defined in Image DataBase. just Browse Images and define folders where you want to copy that Image, which you are currently Viewing..
so let I defined :: 4 directories where I want to copy my images according to image property. Hey! !, when you see an Image of "folwer" in Image Manager Window ==> Hey, For what you are waiting, just HIT 'Numpad key 1' key. Hey! 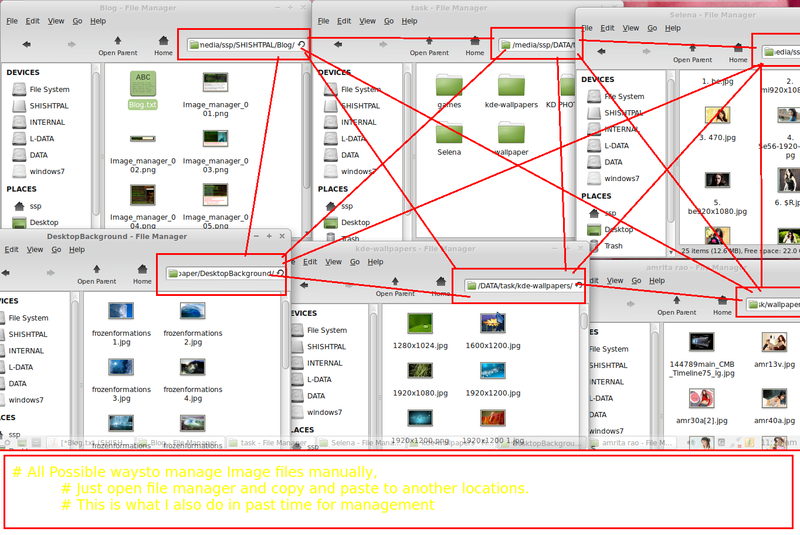 !, when you see an Image of "nature in Image Manager Window ==> Hey, For what you are waiting, just HIT 'Numpad key 2' key. Hey! !, when you see an Image of "image related to BollyBood" in Image Manager Window ==> Hey, For what you are waiting, just HIT 'Numpad key 3' key. Hey! !, when you see an Image of "BollyBood - actress image" in Image Manager Window ==> Hey, For what you are waiting, just HIT 'Numpad key 4' key. fo far so good, By default I have defined "Numpad Keys from "0, 1, 2, 3, 4, 5, 6, 7, 8, 9""
=> means You are allowed to define 10 locations for Image Management. all those events into "event_manager function ." 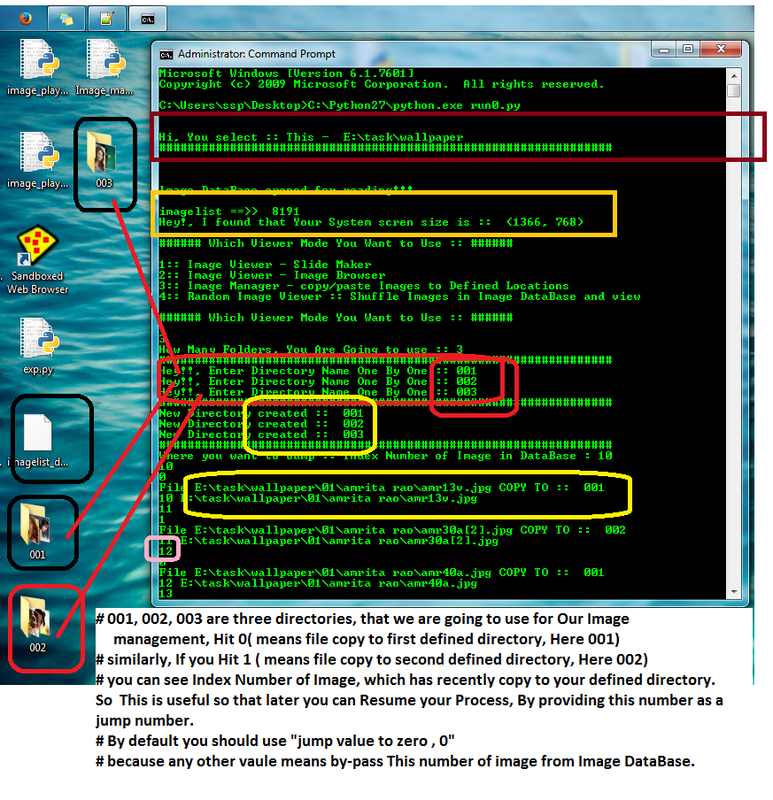 print "\n\t#### Shuffle Image files in Image DataBase :: #### \n\n"
# How to use os.path, os.walk functions. # How to create a list for all Files within a given Directory, Recursively. 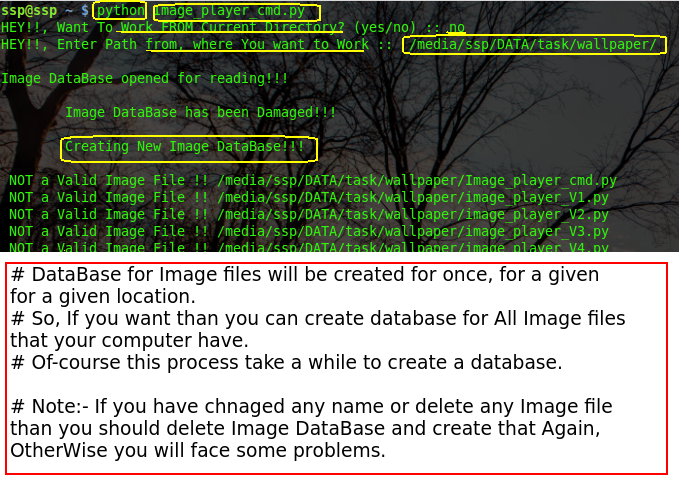 # How to Create Python PIL-Image Object. 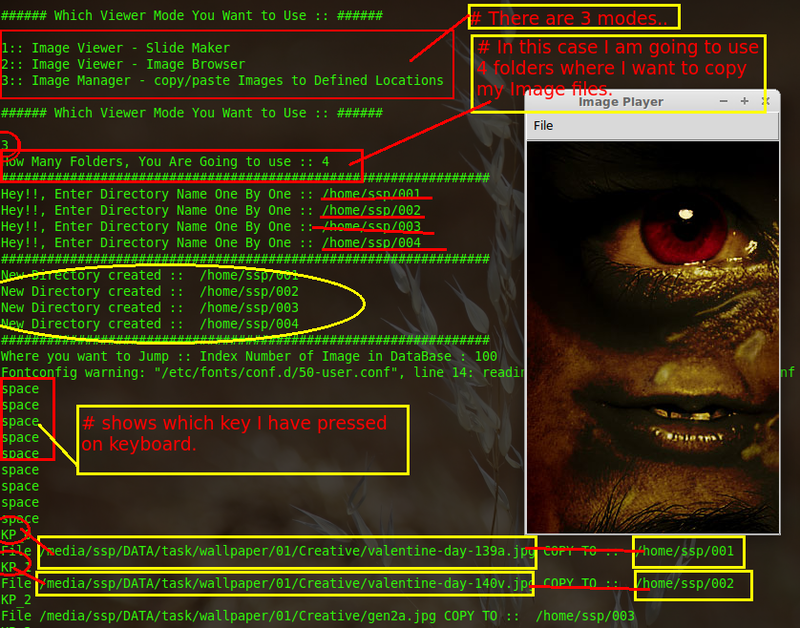 # How To Create a Basic Tkinter Image Player. # How to View image files in Tkinter User Interface. # How to Know Which Key is being pressed from Your keyboard. # How to Bind Key-Board Events to your Tkinter user Interface. # How to Bind Multiple Key-Board Events to your Tkinter Interface and manage all of them. # How to use root.mainloop() = for a Tkinter Interface Works. # How to use root.quit() to exit Tkinter Interface. # How to Copy files using shutil Python Module. # How to DUMP python objects to file and load them back whenever needed using Python-Pickle Module. # How to fix the location of Tkinter Interface on your Desktop Screen. # How to Add a menu bar to Tkinter Interface and bind button/seperator to Menubar. # How to add canvas to Tkinter window. # How to add scroll-bar to Tkinter Interface and set with canvas Image tag. ##1: I found This Problem, while Running Script. ##3: How can I Extend The Funcationality of this script. ##4: How Single File Python InterPreter Works. ##5: How to UN-Install this Application. ##6: How To run This Application from a USB or Mico-SD Card. ##7: I Have this Problem.